Jaden Severy is one of three high school football players from BC named to the 2018 All-Canadian Team. Although he plays both offense and defense he won for his role in the Raven’s secondary. Jaden has been a leader on and off the field from the moment he started at his school. 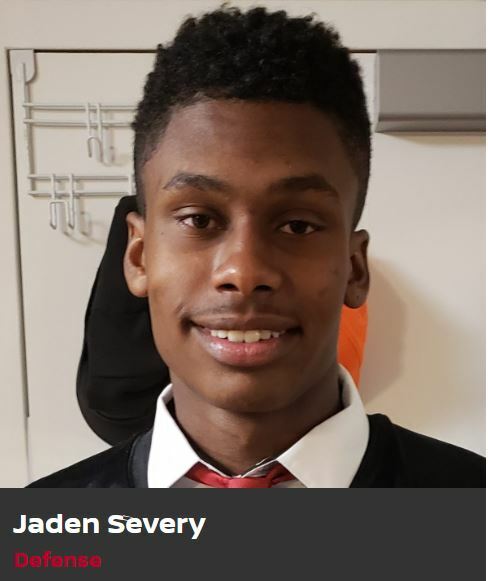 He was asked to join the SR team as a grade 10 starter on both O and D.
As part of the honour Jaden will be one of the 70 Canadian high school football players travelling to the Grey Cup in Edmonton. The Sr Ravens are playing at BC Place in the quarterfinals Saturday Nov 17th at 7:30pm. Come support the Sr Ravens at BC Place, bring your Raven PRIDE and the NOISE!!! Good Luck and Go Ravens!!! Nissan is proud to introduce the 2018 All-Canadian TITAN team. Congratulations to the exceptional high school football athletes selected to join the Nissan All-Canadian TITAN team! Meet the 70 young Canadians who will be celebrated in Edmonton at the 106th Grey Cup. As football’s biggest fan, Nissan supports youth football athletes across Canada. At Nissan, we understand that great football begins with great character. When the right values are nurtured – like hard work, determination and leadership – we are supporting the development of exceptional individuals. The Nissan All-Canadian TITANs are just that. The last time the Terry Fox Ravens played football against Notre Dame at BC Place, in 2016, they won the Subway Bowl provincial AAA championship. Ravens coach Martin McDonnell hopes Saturday’s quarter final date with the Jugglers will destine his charges to similar success.